The Robinson Helicopter Company is the absolute leader in terms of number of sold helicopters and its popularity in many different countries all over the world. Robinson Helicopters is versatility, reliability and purchase affordability at the same time and also subsequent operational cost efficiency. 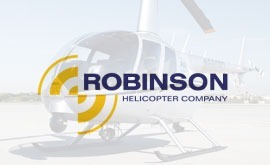 The “Robinson Helicopter Company”, based at Zamperini Field in Torrance, California is a manufacturer of mainly civil helicopters. Robinson produces three models — the two-seat Robinson R22 (see), the four-seat Robinson R44 (see), both of which use Lycoming piston engines, and the five-seat Robinson R66 (see), which uses a turbine engine and also new training helicopter instroduced as Robinson R 44 Cadet (see). “Robinson Helicopter Company” also produces the Robinson Helipad, a modular helipad designed for light helicopters. The company was founded in 1973 by Frank Robinson, a former employee of Bell Helicopter and Hughes Helicopters. Since delivering its first helicopter in 1979, Robinson Helicopter has produced over 10,000 aircraft. Plans for production of the Robinson R66 were announced in March 2007. It is a five-seat helicopter of similar configuration to the R44, but with the addition of a luggage compartment, wider cabin (by 8 inches), and powered by a Rolls-Royce 300 gas turbine engine. Robinson is an engineering company that places great emphasis on research and development. In 2013, Robinson was the global market leader, selling 523 light helicopters, a 1% increase from 2012. However the production in 2014 was 329 aircraft. In 2015, Robinson produces one R22, 4-5 R44 and three R66 per week, and has contracted with to supply 100 RR300 turbines per year for 10 years for the R66. The factory can produce up to 1,000 helicopters per year. The organisation has a global network of more than 110 factory-authorised dealers and 290 service centers in 50 countries, including China and Russia where Robinson Helicopters hoover over groung almost every day.